Not sure what to purchase for that special gift? Let the recipient choose their own. 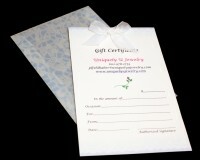 You can give it personally or I can mail the certificate directly to them.